Policy- and decision-makers in government and industry constantly face important decisions without full knowledge of all the facts. They rely routinely on expert advice to fill critical scientific knowledge gaps. There are unprecedented opportunities for experts to influence decisions. Yet even the most experienced can be over-confident and error-prone, and the hidden risk is that scientists and other experts can over-reach, often with good intentions, placing more weight on the evidence they provide than is warranted. 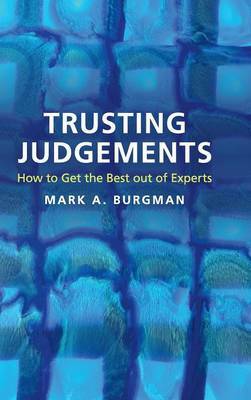 This book describes how to identify potentially risky advice, explains why group judgements outperform individual estimates, and provides an accessible and up-to-date guide to the science of expert judgement. Finally, and importantly, it outlines a simple, practical framework that will help policy- and decision-makers to ensure that the advice that they receive is relatively reliable and accurate, thus substantially improving the quality of information on which critical decisions are made.